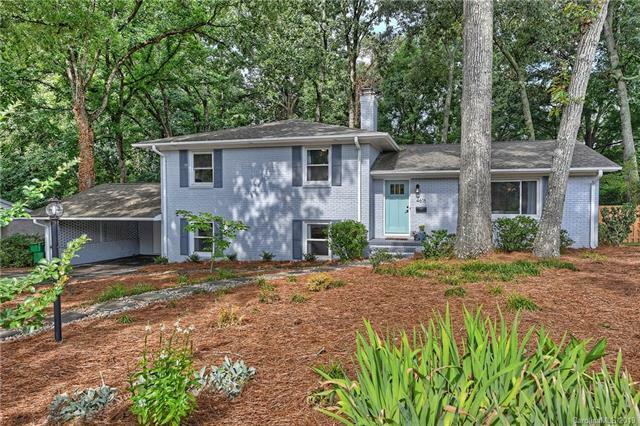 Attractive, updated, painted brick home in a popular Sherwood Forest! Open main level floor plan, crown moldings, wood flooring and great natural lighting. Kitchen updated with marble counters, tile backsplash and stainless appliances. 3 Bedrooms, 2 full baths on upper level. Family/Rec Room, 4th Bedroom, full bath and laundry on lower level. Bathrooms are updated with tile and granite. Separate, detached heated & cooled Bonus Room was added behind carport, bringing total hsf to 2,545. Sealed crawlspace, fenced rear yard, spacious patio and large storage room in 2-car carport. Conveniently located for quick access to Uptown and popular shopping and dining in Cotswold or South Park.